In horrible news, the Times is reporting that the Native American depicted and created mural at the Wilson-Pacific building were vandalized over the weekend. According to the artist, Andrew Morrison, he knows who did it because "he was stupid enough to sign his name." The words DAPKILO were painted over, said Morrison, who sent me the photo you see above. DAP is the name of a crew of graffiti artists. It stands for Down Around Pike, said Morrison, and KILO is the name of one of their artists. It remains to be seen how this can be mitigated but these were not the actions of "graffiti artists" but of vandals. Hopefully the paint can be removed. I think this was an impersonation, a setup. No one would use their real tag on vandalizing the most iconic walls in the city. I do not believe this was DAP, no way. I live a couple of blocks from here, and I have taken such joy in these murals and the fact that they, tempting as they are, have remained untagged for years. Now this. I cannot begin to imagine how dark the mind must be that could do such a thing. How terrible it must be to be that sad, sad person. This is so heartbreaking. I hope there is a way to fix them. I recall a few years ago the Norwegian mural in downtown Ballard was tagged and they repaired it, but it was a much smaller tag than these are. This is absolutely appalling. This act of vandalism happened the day before the official remembrance and commemoration ceremony for the Indian Heritage School, organized by the UNEA and the Clear Sky Native Youth Council, and days before they will vacate the site and SPS begins to prepare to tear the building down. 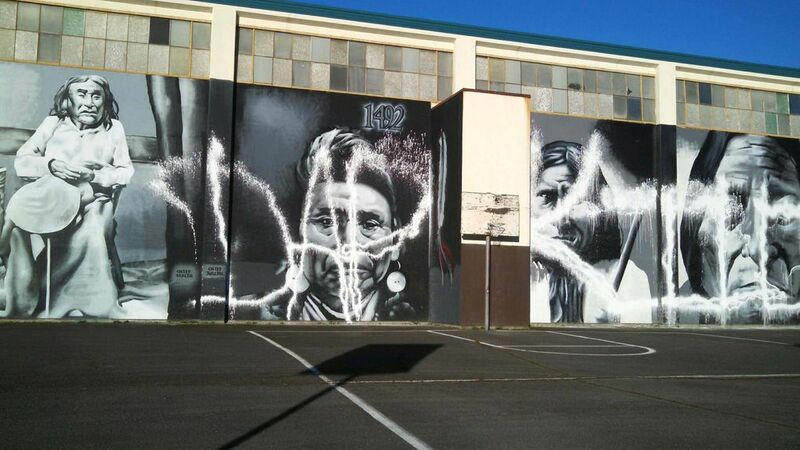 The Native community that has used that space as a gathering place and place of learning, long after the closure of Indian Heritage, are already facing dislocation and the loss of many of the murals throughout the building that will be destroyed in the teardown. This vandalism of some of the few that were going to be preserved makes it even worse. KING-5 is reporting that there is a lot of hope that the damage can be repaired: video is here (warning: it's autoplay, so you'll wind up watching a lot of KING-5 news if you're not careful! Yikes!). If you don't want to watch, the upshot is that the tagging paint is water-based and the original paint is oil-based, so removal of the tag without removing the murals should be possible. I certainly hope so. That is good news Josh! I hope that is correct. Just saw a tweet, #NativePride that the murals have been repaired! The vandal paint has been removed. I walked past there with the dog a few minutes ago: the paintings are good as new! The artist, however, says that he had to chase a tagger gang away last night, and a couple of nice guys are staying the night in the parking lot to keep watch. What is WRONG with people that they'd want to mess with these beautiful works, just to hurt people they don't even know? Director Patu on Leave Due to Death in Family. How Fast Did You Read in Kindergarten? Who are the Golden Two?